* This story is part of a fortnightly series on accelerators and incubators in which we compile report cards highlighting the successes and failures of the startups they nurtured and spawned. When Ashish Bhatia, Mona Singh and Abhay Chawla first launched India Accelerator in 2017, technology was coded into its DNA. Prior to setting up the accelerator, the founders initially operated a technology services company called AppWorks Technologies, which developed technology platforms for startups. Instead of charging the startups a fee for their services, AppWorks Technologies received equity stakes in the companies. It also offered digital marketing services to the startups. Over time, the founders realised that their firm had morphed into a full-fledged entrepreneurial venture that provides emerging firms a host of services, facilities and resources. In March 2017, they pivoted to India Accelerator, a platform that adopts a cohort-based model taking on startups in batches every six months. Late last week, the Gurugram-based mentorship-driven incubator raised seed funding from InvestMind Solutions Pvt. Ltd and HotStart Ventures. India Accelerator is also part of the Global Accelerator Network, a group of more than 85 accelerators worldwide. The accelerator, which has two centres in Gurugram, supports startups at the seed stage when they already have a go-to-market idea or product. “We don’t fund ideas,” said Bhatia. For India Accelerator, investing at the very early stage is risky due to the lack of data available for identifying opportunities. India Accelerator has divided its business into two parts—the accelerator, which is headed by Bhatia and Singh, and a co-working space, led by Chawla. Till date, the accelerator has completed two cohorts incubating 12 startups in total. It has picked equity stakes in each and offers the startups funding, a technology platform, marketing know-how, networking opportunities, a co-working space and mentorship. It had invested around $150,000 as seed investment in the six startups from its first accelerator batch and it intends to put in the same amount into startups from the second batch we well. 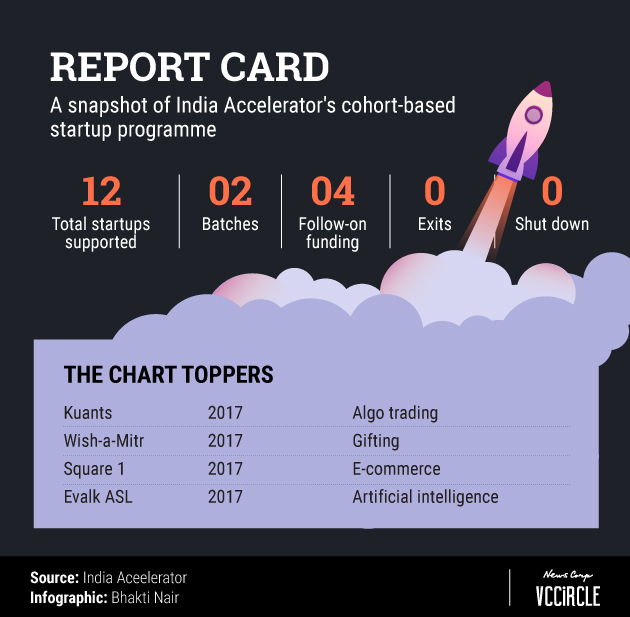 While the relatively young accelerator has yet to seize an exit, four startups— Kuants, WAM (Wish-a-Mitra), Square 1, Evalk ASL—from its cohort have already received follow-on investment, achieving a conversion rate of 33.3%. Below is a brief snapshot of the startups from India Accelerator’s cohorts that have raised funding from investors. Kuants: This Gurugram-based startup was founded in 2017 by IIT Kharagpur graduates Ayush Gangwar and Mohit Bansal. It provides users tools and infrastructure for algorithmic trading and claims to have expertise in web-based stock market simulation and high-frequency data management. In January 2018, it raised Rs 50 lakh (around $80,000) from Delhi-based angel investors Pankaj Chopra and Ankush Gupta. WAM (Wish-a-Mitr): Founded by Kanika Dhyani and Pooja Verma in 2017, the platform offers gifting services curated from offline and online stores. The startup’s response-based engine provides tailored recommendations to users so that they can buy gifts which are more relevant and useful to them. Angel investor Gupta, who had also put in money in Kuants, has invested an undisclosed sum in WAM in its follow-on round. 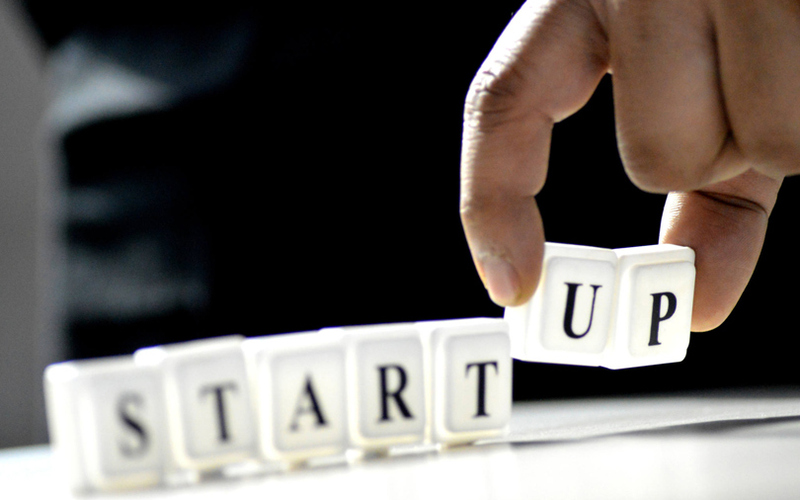 Square 1: Founded by Gaurav Nagar and Naved Khan, it is a launch pad for e-commerce projects. The open source framework provides merchants with a flexible shopping cart system and control over the look, content and functionality of their online stores. The startup received an undisclosed amount in follow-on investment from angel investor Deepak Juneja. Evalk ASL: Founded in 2017 by Roman Wyhowski and Kostya Bondar, this Ukrainian-based startup develops software that translates American sign language (ASL) into speech. Its uses video recognition technology based on recurrent convolutional neural networks to do the translations. These startups are yet to raise follow-on investment but India Accelerator have taken them on board because their promising business models. Voko: This Gurugram-based startup was founded in 2016 by Harsh Vardhan and Bhuvnesh Sharma. It is an online rental platform that provides consumer goods such as cameras, home appliances and furniture, among others on rent. Currently operational in Delhi-NCR, Voko works on an aggregator-based asset-light model. CabBazar: Founded in 2017 by Amit Dhall, Deepanshu Rustagi, Dinesh Sharma and Rishabh Gupta, this Gurugram-based startup is an online cab aggregator for outstation travel. It gathers prices from various travel agencies on a single platform, thus allowing users to bid, compare and book one-way, round trips. GalaxyCard: Founded in 2017 by Amit Kumar and Gunjeet Singh, this Gurugram-based startup offers a mobile-based instant credit card where customers receive, manage and repay their credit within an app. Compared to a regular credit card application which takes around three weeks, GalaxyCard users can get access to a credit card in less than three minutes, without any manual intervention. Insurance Samadhan: Founded in March 2017, this Delhi-based startup operates a grievance redressal platform for insurance policyholders, where they can register complaints related to issues such as fraud selling, claim settlement and more. It was set up by lawyer Sanjay Aggarwal and insurance veterans Shailesh Kumar and Deepak Uniyal.